Holiday season is upon us, and my stove has been running 24/7, so rather than disrupt the baking flow, I decided to keep going. Besides, I love, love, love Middle Eastern pastry. Soaked in honey, rich in nuts and most often served with strong dark coffee, I'm betting that this Arabic Honey Cake will be even better tomorrow when the cake has fully absorbed the honey-caramel topping. And, because Middle Eastern pastry is so sweet and dense, one only needs a small amount to satisfy even the most extreme sugar craving. Located in the Northeastern portion of the Arabian Peninsula in Western Asia, Kuwait is bordered by Saudia Arabia and Iraq and sits on the Persian Gulf. 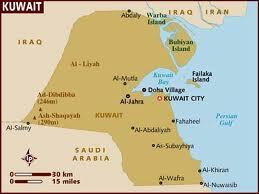 Kuwait boasts the 5th largest oil reserves in the world, and is the 11th richest country in the world as well. Kuwait's cuisine is influenced by Indian, Persian, Mediterranean and Najdi traditions. Lamb, chicken and fish are most often eaten, but pork is forbidden in the Islamic country. Romaine lettuce, cucumbers, tomatoes, radishes and red onions are typical salad vegetables. Like many Middle Eastern countries, cardamom, coriander, cumin, cinnamon, nutmeg, cloves and paprika are commonly used spices. Rosewater and tamarind syrup are used to scent and sweeten pastry as well. Butter a 10-inch spring form pan. Preheat over to 400F. Beat the eggs, sugar and vanilla until it whitens. Add the melted butter and mix well. Sift the flour and baking powder together and add to the batter, mixing gently. Pour in the prepared pan and bake 10-12 minutes. Meanwhile prepare the topping. Melt the butter on medium heat. Add the rest of the ingredients and bring to a boil, stirring constantly. Pour the topping gently on the cake and return it tot he oven for another 15-20 minutes. Let cool and then serve with coffee. that looks absolutely amazing ! And Alex loves honey...must make this !! thank you !! This looks awesome... can't wait to try it!